Osamu is rode on the wagon train with his family during the 1997 trek. Osamu (Sam) and his wife, Takako, live in Tokyo, Japan. They have lived in Provo, Utah to study at Brigham Young University. 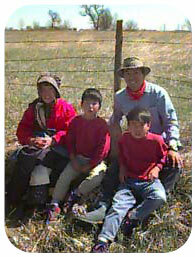 They decided to participate in the Pioneer Trail trek with his two sons, Yuji and Koji. At the time of the trek, Yuji (8) was in the third grade and Koji (6) was in the first grade of Nerima Higashi Elementary School. Why did the Sekiguchis join the trek? Osamu summarizes the reasons of their joining the Pioneer Trail trek. I always wanted work harder on strengthening my family bond. And I always believed that it is my responsibility after all to teach children. It's not something I leave it to school. But I was too busy to spend time with my family and started to seek opportunities to discuss, work on and face the challenges to achieve one common goal as family. Then I learned about the Pioneer Trail in which I thought was the best opportunity for our children to see the country where they were born while we were studying in U.S. as well as learn about the pioneer spirit - the power that built the country of the United States of America.